Today I found another Linux CAD software that will be out soon, I'm talking about DraftSight. While not available yet in Linux version it's a free alternative to other programs in 2d drawing. According to the manufacturer "Mac OS and Linux support will be available later this year". A very important feature related to Draftsight is the name of developer - Dassault Systemes - Don't you know them? And if I mention the name SolidWorks? And Catia? Well, we are talking about a major cad dealer. Can this mean that we have competition on CAD software on Linux? Answering the previous question - YES ! At this time, economical Autocad Linux alternatives were just one - Bricscad, but there is already another one available for download. I'm talking about German Grabert's ARES Commander. Right now to be able to try the software you will need to register as a Beta-Tester to get the download link. After installation you will be able to enjoy a complete 2D cad with DWG support. Actually from the short time that I tried out it looked a bit faster in processing DWG than Bricscad, however it looks very professional, clean looks and practical. At this moment this software is commercial available for OSX, and Linux became a little late. 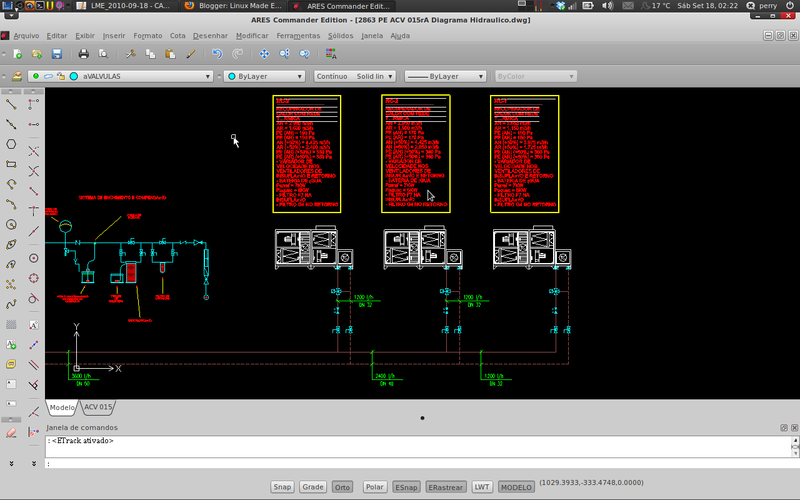 However for what was tried out, it will be a good competitor for Bricscad, Autocad e for certain Draftsight. Hoje tomei conhecimento de mais um software de CAD para Linux que está para ser lançado em breve, estou a falar do DraftSight. Este software, ainda não disponível na versão Linux apresenta-se como uma alternativa gratuita a outros concorrentes no desenho 2D. De acordo com o fabricante "Mac OS and Linux support will be available later this year". Um factor muito importante neste software é o nome do seu fabricante - Dassault Systemes - Não sabe quem é? Então e se lhe falar no nome Solidworks? E Catia? Bem, estamos a falar de um dos principais fabricantes de software CAD no mundo. Poderá isto significar que até já temos concorrência em programas CAD em Linux? Respondendo à pergunta anterior - SIM!!! Neste momento, alternativas económicas a Autocad em Linux, tínhamos 1 - Bricscad, mas existe outra actualmente e já disponível para download. Estou a falar de ARES Commander da Alemã Grabert. Neste momento tirar partido do software terá de se inscrever como Beta-tester para obter o link do download. Após instalar o programa poderá disfrutar de um completo software cad 2d com suporte para DWG. Actualmente do pouco tempo despendido a experimentar este software, pareceu-nos mais rápido no processamento dos ficheiros DWG do que o Bricscad, mas no entanto apresenta um aspecto bastante profissional, limpo e prático. Actualmente este software encontra-se à venda para OSX, tendo atrasado o lançamento em Linux, no entanto, pelo que já vimos, será um concorrente à altura do Bricscad, Autocad e concerteza do Draftsight. Siemens has provided Unigraphics/NX for years under Suse and now RedHat. Dassault is really just playing catch-up. They just need to port their major package CATIA V5/V6. NX is used by GM, Nissan, Chrysler to name a few. In my observation, Solidworks is king. Unigraphics, CATIA, and even AutoCAD anymore, are niche players compared with SW. Interesting development for sure. Draftsight for MAC is out!